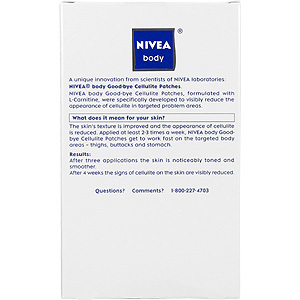 NIVEA body Goodbye Cellulite Patches, formulated with L-Carnitine, were specifically developed to visibly reduce the appearance of cellulite in targeted problem areas. After 2 weeks skin is visibly firmed and toned. Good Bye Cellulite uses L-Carnitine as a fast acting treatment that helps reduce the appearance of cellulite in places where you have problems. L-Carnitine promotes the fat and converts it into energy. After only 3 treatment your skin will have a more firm, tones, and smoother look to treated areas. What does it mean for your skin? The skin's texture is improved and the appearance of cellulite is reduced. 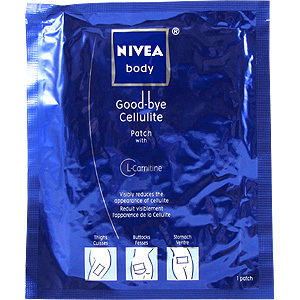 Applied at least 2-3 times a week, NIVEA body Goodbye Cellulite Patches get to work fast on the targeted body areas - thighs, buttocks and stomach. After three applications the skin is noticeably toned and smoother. After 4 weeks the signs of cellulite on the skin are visibly reduced. Warning: Please follow the recommended usage instructions. While using the patch, you may fee slight heat or tingling; after removing patch, skin may be slightly red. Do not reapply on red skin. If redness or irritation is prolonged, stop use and seek medical advice. Water/equ, Sorbitol, Glycerin, Polyacrylic Acid, Sodium Polyacrylate, Propylene Glycol, Cellulose Gum, Kaolin, Carnitine, Tartaric Acid, Hydroxypropylcellulose, Ricinus Communis (Castor) Seed Oil, Dihydroxyaluminum Aminoacetate, Disodium EDTA, Methylparaben. I was both shocked and amazed at how well these patches work. Will most definitely be buying more of them. 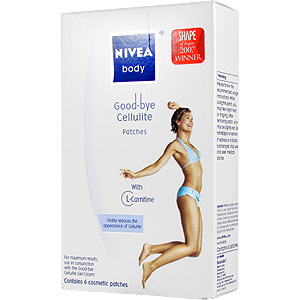 Goodbye to cellulite forever! 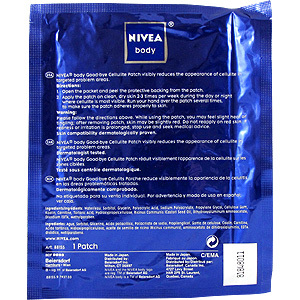 Lady In Action "Nivea Way To Go"
This Japan made patch surely has superb technology in it. Bye bye to my cellulite and rough skin after 3 weeks using it. The name of this product is great. That's exactly what the product does. I have not noticed anymore cellulite. They have just disappeared. I still have my cellulite. I will continue using and hopefully get better results. Samantha "I take it back!" This stuff really works. I continued using it and my cellulite is completely gone. You only have to give it time. 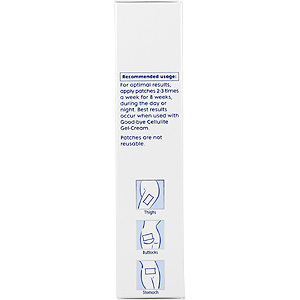 Goodbye Cellulite Patches - Reduce The Appearance of Cellulite, 6 pc is shipped in a discrete, unmarked package. Orders are processed immediately and usually takes about 3 to 5 working days to be received. We do ask that you try it for 2 to 3 weeks to feel the full effects. Any information received is used only for order processing and shipping purposes. Your information, such as e-mail address, will never be disclosed to a third party.